Excuse us while we blow our own trumpet a little. When it comes to cross-vertical, global B2B market insight, there isn’t a lot we don’t know. Or, at least, that’s what we thought. The crazy thing is that the more you know the more you find there is to discover, and there really is no limit to the depth of information available. And we’ve been in pretty deep for a while now. That’s why we’ve decided to share some of the insights we have gained. This is not ‘sit on grandad’s knee and he’ll tell you about one or two things he knows’ type stuff. This is insight derived from real data. 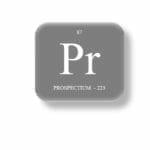 Here’s the first of our SoPro Insight Series, and we’re going to tell you the best times to send your finely crafted prospecting emails. When’s the best time to get in touch? Just before we dive into the stats, we want to make it clear that we haven’t discovered how to supercharge your pipeline by watching the clock. For a start, there’s the quality of the prospects we target: even the most precision-timed and carefully-crafted intro won’t help you sell to the wrong person. And there’s the subject lines we use: we’ll dish out some tips of the trade for prospecting email subject lines in a later post. In fact, there are probably a dozen or so factors that impact success just as much as choosing the right time of day to make contact. So why all the fuss about time of day? Simply because if you get this right the percentages start to stack up in your favour. And it’s pretty easy to do. What follows is our analysis of 1M introductory prospecting emails sent over the last 12 months. There have been plenty of these sorts of studies carried out before. If you want a quick review of what HubSpot, WordStream, MailChimp and others found out this review by CoSchedule summarises ten high-profile studies. Yet, every single one of them takes as its starting point the issues faced by those sending newsletters or promotions to a mailing list. Every single one of these emails was sent to a cold prospect. A simple, personal, custom message from one individual to another. Just to stress we also haven’t delved into the differences between, say, large businesses selling to startups or software businesses selling to marketing agencies. Those sector and size specific insights are topics in their own right and are scheduled for later in the series. 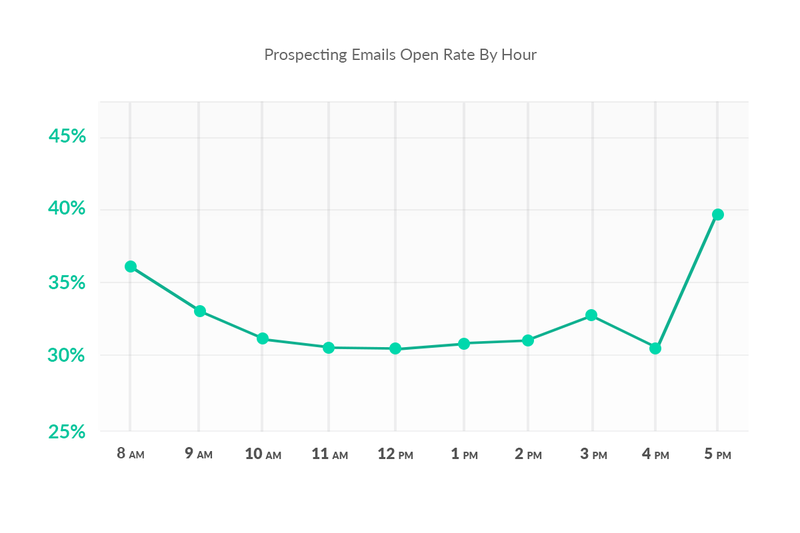 What time of day does email prospecting offer the sunniest prospects? We’ve taken the results from 998,384 emails that were successfully delivered over the last 12 months. We’ve capped our send times to start from 08:00 in the morning to 17:00 in the evening – simply because we send so few out beyond these times that the statistical variances would no longer be useful. And here are the results for open rates by hour. As you can see the variance is certainly significant. The uplift from the lowest (30.66%) to the highest (39.88%) actually translates to a whopping 31% uplift in the likelihood of emails being opened. That is HUGE. We were surprised by the 17:00 stats – but we decided not to dwell on them. You’ll understand why when we show you the response rates. What is worth highlighting, though, is that early morning emails tend to see far better open rates, with a secondary peak around 3pm in the afternoon. Now let’s take a look at those response rates, because after all, opening an email isn’t really the objective here. What we really want is a response. It was this data that really had us sitting up in our seats: the potential gains are crystal clear. From an average response rate of 18.76% (pretty good in itself, don’t you think?) the time of day sees variance from 4.62% (13:00) to 26.84% (10:00). In fact, emails sent between 08:00 and 11:00 represented 46.35% of the total, yet they accounted for 75.77% of all responses. The jury is in and the verdict is clear: when it comes to B2B prospecting, the early bird does indeed catch the worm. We’ve got plenty more gems like these waiting to be hauled out of our prospecting goldmines. Check back in a bit and we’ll bring you some more.